Coulthard had a heavy load of fuel (he went 65 of the 78 laps) and he found himself stuck behind Enrique Bernoldi's Arrows, trolling along with enough fuel to get him to lap 43. The weight difference of the two cars was probably about 50kg and that meant a second and a half or two seconds per lap. This being Monaco that was that. David had no chance and spent the afternoon stuck behind Bernoldi. By the time that the Arrows went into the pits David was a lap behind the leaders. His lap times went from 1m24s and 1m25s to 1m21s and 1m20s. But it was too late. He was able to clamber up a few places and with a high attrition rate he ended up fifth, taking two points home with him. But with Michael Schumacher getting 10 points again the gap at the front grew to 12 points. Everyone else is wasting their time. After the race Michael Schumacher was not overjoyed with his 48th victory. "I was asked why I didn't jump on the podium," he said. "Honestly, I don't feel that emotional because it has been a very straightforward win. It wasn't anything exceptional, nothing exceptionally happened through the race, which could make you emotional. It's always nice to win in Monte Carlo. It's always special, but it was straightforward. It was tiring to some degree. The only thing you think about is reliability. It is very easy to make mistakes here. It is a hard circuit and although it was an easy drive, it was still hard." Michael was never really challenged after Coulthard disappeared. Hakkinen tried to keep up but he couldn't do it in the early laps. Then he pulled up closer to the Ferrari and as he was doing so the car suddenly started to pull to the right. Mika decided to go into the pits to have the car checked over. The crew could find nothing obvious and Mika was sent out again but the problem was still there. "I decided it was impossible to go flat out," said Mika. "There was no other option than to retire. We are not sure what the problem was but I know that I didn't hit anything." Hakkinen's problem lifted Rubens Barrichello into second position and there he stayed. For five laps when Michael Schumacher pitted, Rubens led the race but there was no way he was going to beat Michael (even if he was allowed to do so, which is doubtful after what happened in Austria). The problem was that from early in the race Rubens had cramps in his foot. "Ross (Brawn) became a physiotherapist because I was telling him that if he knew something I could do inside the car because it was really really bad," said Rubens. "At one time I could hardly feel my right foot. He was saying "drink water, drink water" but after a while that was gone. I was having quite a lot of problems. I was asking God to give me a chance to race because the car was brilliant. I never had a car as good as this one today." The end result was not an indication on how close the two Ferraris were in terms of performance. In the final laps Michael was not pushing much and let a 10-second gap dwindle down to 0.4secs at the flag. It looked good on television. It also looked very good in the Constructors' Championship. Ferrari has 76 points. McLaren has 44. Williams has 18. There is no such thing in F1 as a foregone conclusion but a 32 point advantage is useful. However two McLaren 1-2s with Ferrari failing to score and the two teams will be equal again. Logically if McLarens or Ferraris run into trouble third place will go to a Williams, a Jordan or a BAR. But not at Monaco. Third place went to Eddie Irvine in his Jaguar. This may not occasion dancing on the streets of Dearborn or nightingales singing in Berkeley Square (home of the Premier Automotive Group) but it certainly cheered up the folk in Milton Keynes and Northampton. It has not be easy at Jaguar Racing in recently months but hard decisions and hard work have finally paid off. The team's new aerodynamic package worked well. Irvine described it as "by far the biggest development I have ever experienced in F1". Even in his moment of triumph (well sort of) Irvine managed to spoil the moment with a pop at those in the F1 media who have criticized him in recent months. Team boss Bobby Rahal behaved with more dignity. "The magnitude of the task ahead of us cannot be overstated enough and the challenge now is to turn this maiden podium into consistency. Jaguar Racing is not here to make up the numbers. Our long term goal is to win the World Championship. That takes time, resources, stability and consistency. Nevertheless it is just reward for the work everyone has put in." And while the cameras rolled on Eddie, Bobby let us not forget that the groundwork for their achievement was put in place by a man who was in the paddock for the first time this year: Neil Ressler built the foundations for the team. It was not easy and, at the same time, he had to cope with his daughter's terminal illness. He took it and he has taken the vicious criticism that has been heaped upon him. It was right and fair that he was there to see the first glint of what may become a shining future. Pedro de la Rosa's race was solid and he was running 10th when he suffered some form of hydraulic failure which left him, without gears and without a throttle. In the closing laps of the race Irvine was shadowed by Jacques Villeneuve, the only survivor from the four Honda-engined cars. Jacques had qualified ninth, ahead of Olivier Panis (for a change) but behind Jarno Trulli's Jordan. Heinz-Harald Frentzen was the slowest of the four men, down in 13th on the grid. It was dreadful weekend for HH and it ended in dramatic fashion when something went wrong when the Jordan was travelling in the region of 175mph. The car went hard into the metal barriers on the left. Fortunately for Frentzen the car stayed on the left and slid down the road, grinding against the barrier until it came to rest, a sorry heap of carbon composite and mangled metal, just before the chicane. Frentzen complained that he had an unhealthy bash on the head but he was unharmed. Trulli's race was a lot better. He was in the top six by the end of the third lap and when Hakkinen fell by the wayside he moved up to fifth. And then on lap 31 a ghost somewhere in the machine drilled (or perhaps blasted) a hole in something and lots of inflammable stuff fell out and caught fire. Jarno parked the mobile blow torch and the fire marshals did what fire marshals are supposed to do. Olivier Panis's day at the races was none too exciting. He was running tenth until the 13th lap when the car stopped steering in the slow corners and he decided it would be a good plan to stop to see if the engineers could figure it out. The car was checked over and sent out again but the problem was still there and so Olivier returned to the pits and then wandered off to the paddock. And that left Villeneuve. As others fell by the wayside he moved up to fourth. He did not hit anything. He did not break anything. The car kept going. Jacques had never been very good at Monaco but this year he was. Perhaps we are seeing the start of a Villeneuve revival. "We scored more points than a lot of teams," said technical director Malcolm Oastler, "and that is great for our championship challenge." 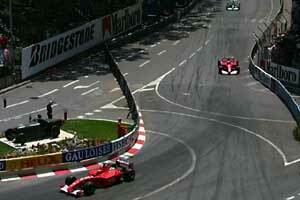 There was not much left of the midfield and so fifth place fell to the recovered Coulthard and sixth to Jean Alesi. The Frenchman might have been fifth had it not been for a puncture with less than 10 laps to go when he was about half a minute ahead of the McLaren. Jean is always good at Monaco and Prost had done some development work and come up with a new aerodynamic package (which was somewhat overdue) and the one point was enough to give the team a little hope. The paddock rumors suggest that soon the team will be sold. Maybe the result comes too late. Alesi's team mate Luciano Burti had the front wing run over by Jos Verstappen at the first corner. This meant he had to pit and so dropped to the back of the field. He later went off and retired. Benetton did not have a great afternoon but it was better than most this year. The Monaco circuit is not one on which one needs enormous top end power and since the Renault engine has very little of that it meant that the habitual problem was no longer there. And so Giancarlo Fisichella (who is always good at Monaco) qualified 10th. Jenson Button had a less easy time and was 17th. In the race both men stayed out of trouble in the early part of the race and ended up sixth and ninth on lap 43, despite the fact that Fisichella hit the wall quite hard at Ste Devote on lap 35. Amazingly the car was not badly damaged and Fisichella continued on his way, without losing a place until the same thing happened again (this time the result of an hydraulic failure) and he did the same again at the start of lap 45. On this occasion the wall removed the left front wheel from Fizzy's car. Button stayed cool and kept his car going. The important point of the race was just before Coulthard's pit stop when he and Button battled to see who would emerge ahead. David won that race but Jenson crossed the line to finish seventh. It was the best run he has had all year. "It was nice to be racing for something," he said. "It was good fun." Eighteen seconds behind Button at the finish was Verstappen's Arrows and Bernoldi, his team mate, was a further lap down in ninth place. As always Arrows ran with light fuel loads. Verstappen tangled with Burti at the first corner and nearly went off but he recovered and overtook six cars before his pit stop. This went wrong and so Jos plummeted back down the order but he rose back up again to eighth. Bernoldi come home a solid ninth. The only other car to make it to the flag was the Sauber of Kimi Raikkonen. He suffered a wheel sensor failure while running 10th and had to pit. The problem was bypassed by the mechanics and Raikkonen rejoined four laps down and drove a steady race (albeit without traction-control) to the finish. Nick Heidfeld's dreams of glory ended on the first lap when he was punted into the wall at Portier, apparently by Verstappen. "I rode up over his wheel," said the German. "It was quite high and I crashed into the barriers." Williams should have got some points because until lap 58 Ralf Schumacher was running third. Then he suffered a power steering failure and that was really that. Juan Pablo Montoya made a good start to move ahead of Irvine but within a few laps he was trying to pressurize Ralf into a mistake and instead made a mistake himself and slid into the barriers in the Swimming Pool section on the third lap. His race was over. "I made a mistake and paid for it," he admitted. The other team which failed to get a car home was Minardi. Both cars ran well until Fernando Alonso suffered a gearbox failure (again) and Tarso Marques suffered a driveshaft failure. With the other underdogs doing well, Minardi really suffered and is now firmly last in the Constructors' Championship.